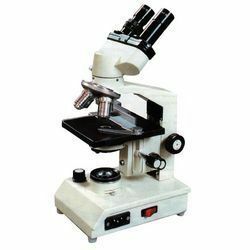 Leading Exporter of binocular microscope, binocular laboratory microscopes, binocular stereo microscope, binocular research microscope and binocular stereoscopic microscopes from Salem. Observation Head : Binocular head is equipped with standard 450 inclined observation tubes, rotatable through 3600 and can be fixed in any direction with clamp screws, interpupillary distance from 53 to 75mm & diopter adjustment are provided. Stand : One piece die cast arm and large size rectangular, heavy stable base with transformer/electrical fittings concealed inside. Nosepiece : Precise quadruple revolving nosepiece with accurate centring and positive click stops for smooth accurate rotation. Stage : Built in graduated mechanical stage size 135x120 mm is controlled by convenient low co-axial positioned knobs (either side as per requirement) for easy and smooth scan of the specimen slide over entire range of 50 x 75 mm. Focusing Power : By vertical movement of stage, coarse adjustment by rack pinion and fine movement by screw lever mechanism having a graduated knob. Condenser Feature : Bright field, abbe's N.A. 1.25 with iris diaphragm and swing out filter holder can be moved through rack-pinion. The condenser unit incorporates high efficiency optical system for optimum utilization of light from low to high magnification. It is interchangeable with professional accessories. Illumination capacity : 6V-20W Halogen lamp fitted directly under the field lenses operated through solid state variable controlled transformer 220 or 110 volts. Mirror attachment while working in day light is also provided. Objectives : Achromatic 4x - 10x - 40x sL and 100 XSL oil immersion. Packing details : In full mould styrofoam / Thermocol container. Accessories : Vinyl cover, duster, cleaning brush, filter & Operating Manual. Optional Accessories : Dark-field condenser, phase contrast equipment, polarising attachment, stage micrometer, micrometer discs, spare objectives, microphotographic equipment and CCTV, wooden storing cabinet etc. Industrial Stereo Microscope is a kind of binocular stereo microscopes, which can magnify micro objects continually and show clear stereo up-right picture. It can be used for observation studies in medical and health, farming and forestry, as well as public security departments, school and scientific research institutes, and is also used for inspections, assembling and repair of tiny precision spare parts in electronics and precision machine industries. 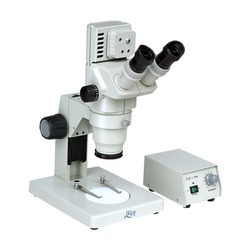 MV-GL6445B series zoom Stereo Microscope is a kind of binocular stereo microscope, which can magnify micro objects continually and show clear stereo up-right picture. Having Working distance of 103 mm ,magnification with 10x to 65x zoom range and Articulating arm stand. 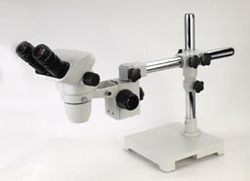 It can be used for observation studies in medical and health, farming and forestry, as well as public security departments, school and scientific research institutes, and is also used for inspections, assembling and repair of tiny precision spare parts in electronics and precision machine industries. 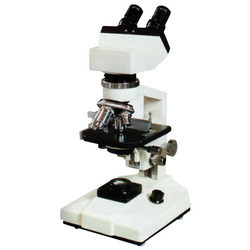 Looking for Binocular Microscope ?